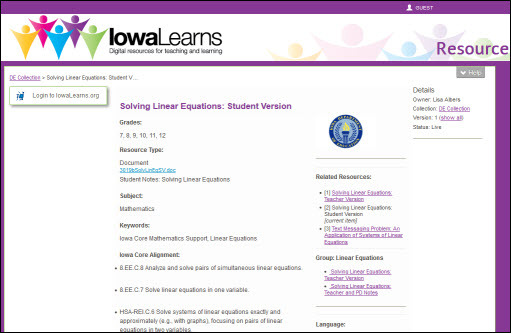 The North Carolina Department of Public Instruction in cooperation with the Iowa Department of Education has made 250+ math related resources available in the NCLOR. IowaLearns.org is a digital repository of teaching and learning resources. The repository provides an environment for educators to search for, use and share quality educational resources. The majority of the Iowa content has been aligned to the North Carolina Essential Standards but is open to everyone to use. Log into the NCLOR and click on “Browse by Resource Series” and then the IowaLearns series. Simply, click Iowa Learns to view the series as a guest. Posted on July 7, 2015, in New Collection Posts and tagged Algebra, Developmental Math, Geometry, Mathematics. Bookmark the permalink. Leave a comment.